I am member of scientific committee, co-organizer, and moderator of this conference. 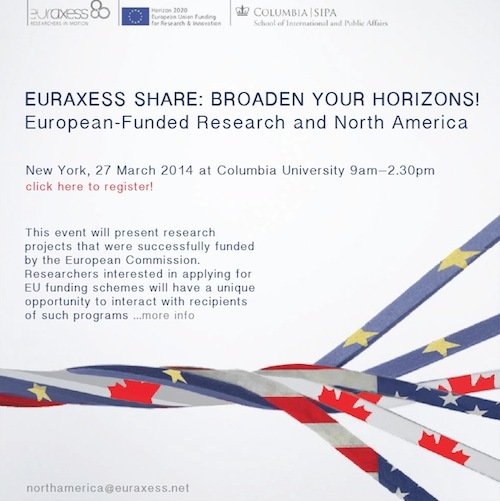 “EURAXESS Share: Broaden your Horizons!” takes place in New York City on March 27th, 2014 at School of International and Public Affairs, Columbia University. The aim of the event is to foster interactions between recipients of EU funding programs based in North America and researchers who are interested in applying for one of these funding schemes, as well as to showcase research projects that were successfully funded by the EU (Marie-Curie and ERC) and promote EU funding schemes.